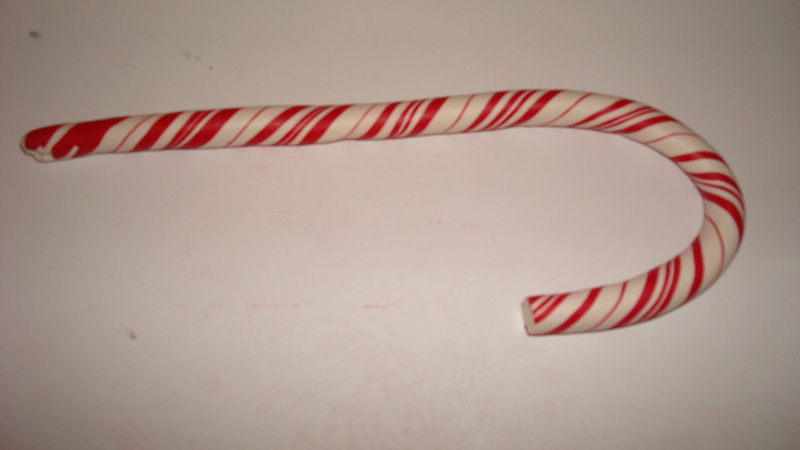 Guess what my family will be getting for Christmas Gifts! 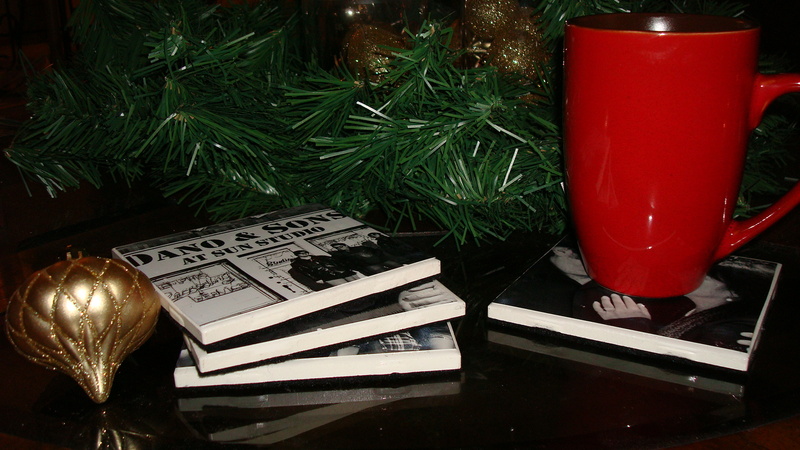 Yes, you guessed it, Photo Coasters! 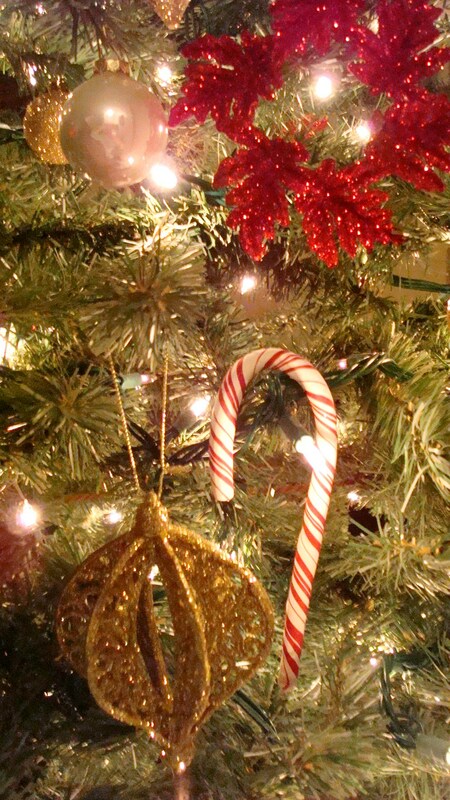 These turned out wonderful, very easy to create and won’t break your Christmas budget! 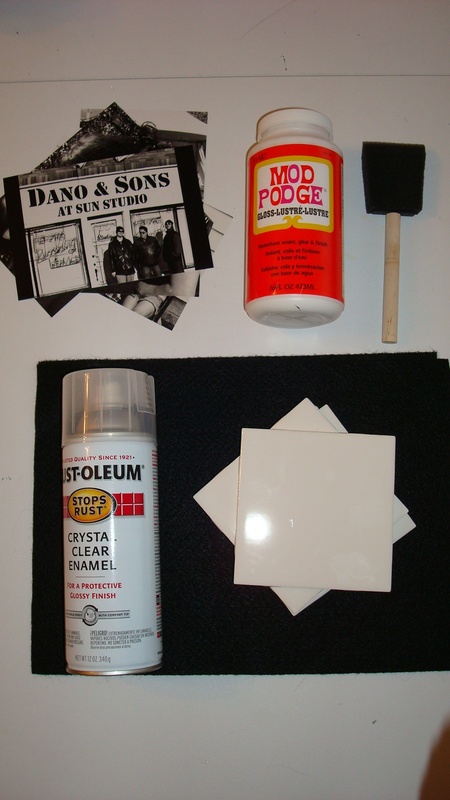 Step 1 – Make sure the ceramic tiles are clean. 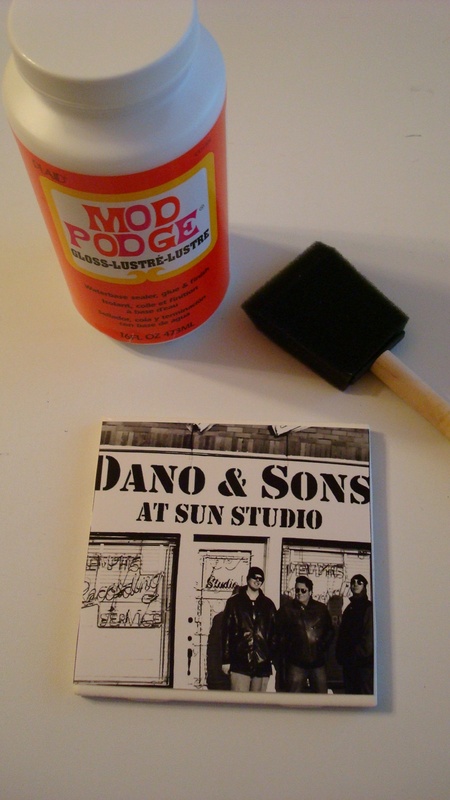 Use the sponge brush to apply Mod Podge to the tile. Adhere the photo. Allow to dry. 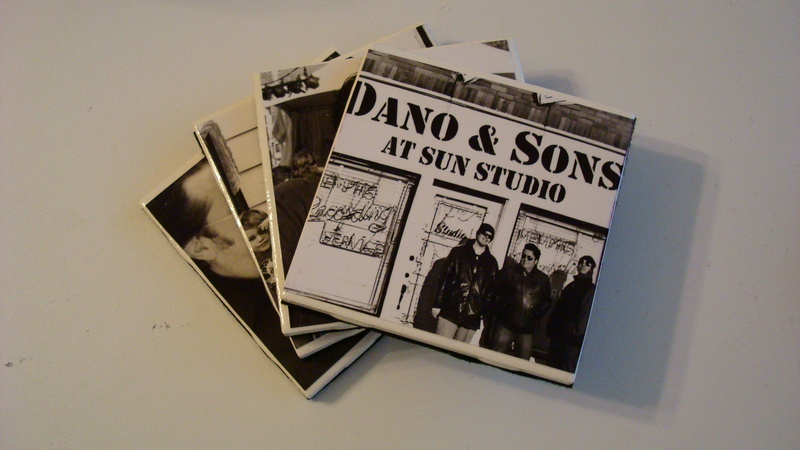 Step 2 – Spray the tile with enamel, allow to dry. 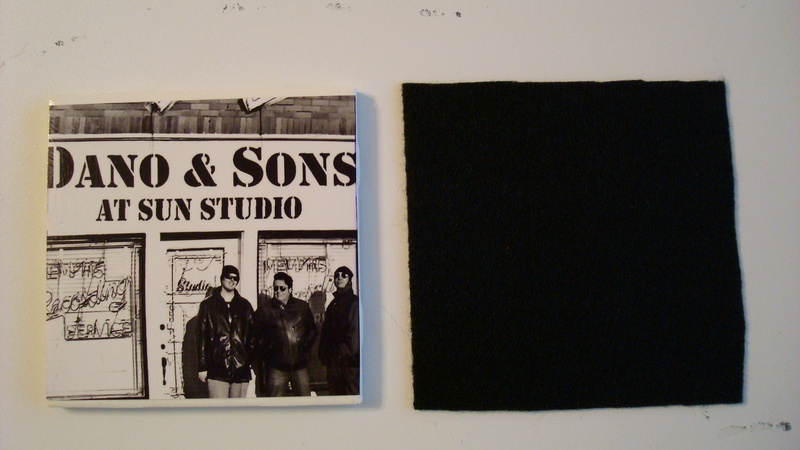 Step 3 – Cut and glue the felt to the bottom of the coaster. I dreamed up these candles and I’m in LOVE with them! The Ghost Candle came out lovely! To make them, I used the water candle technique. 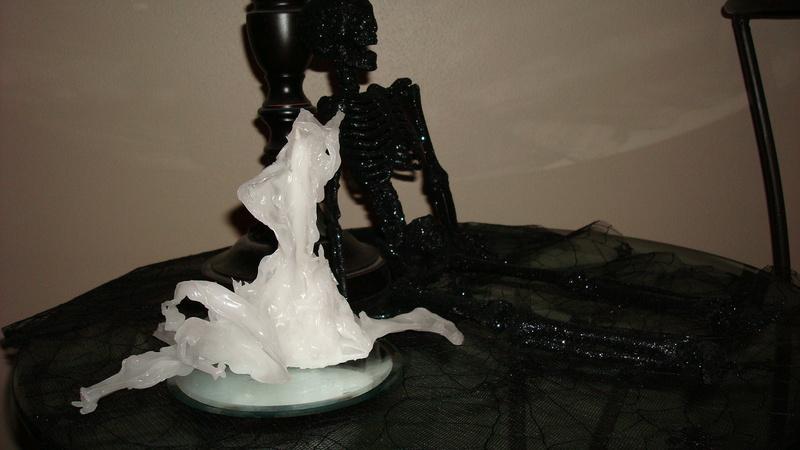 Basically, you submerge hot wax in cold water to get the whimsical flowing effects. A lot of fun! Step 1 – Melt your wax in the double boiler. I didn’t have a double boiler so I had to improvise. I used empty/clean glass jelly jars to melt the wax in. 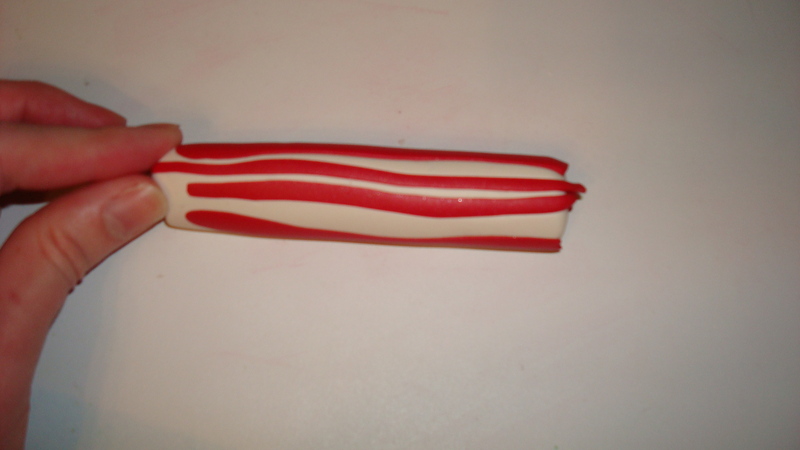 Step 2 – I broke the taper candles into three pieces. They were too tall. 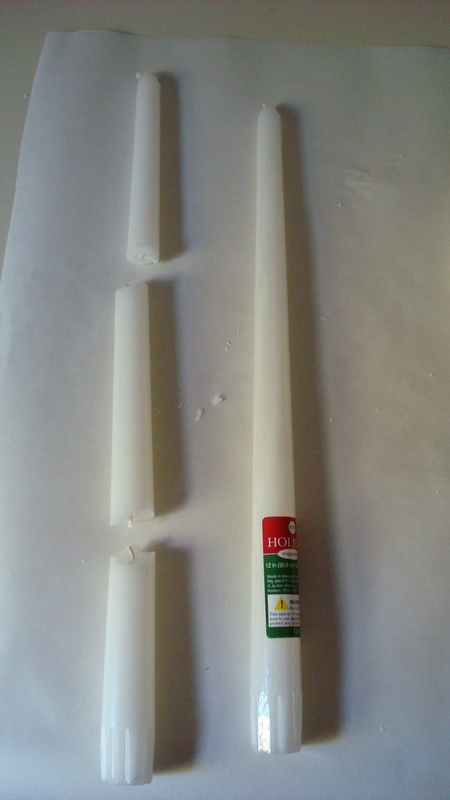 It is necessary to completely submerge the candle in water, therefore the taper candle shouldn’t be taller than the level of water in your sink. 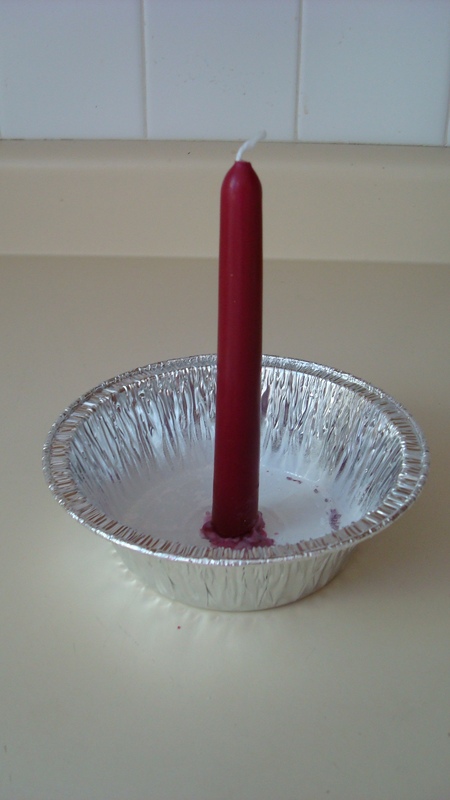 Step 3 – Use some melted wax to “glue” the taper candle in the center of the aluminum pan. Step 4 – Using oven mitts, pour the hot wax into the aluminum pan. Using both hands, submerge the pan with the hot wax. It took me several attempts to build the candle pictured. 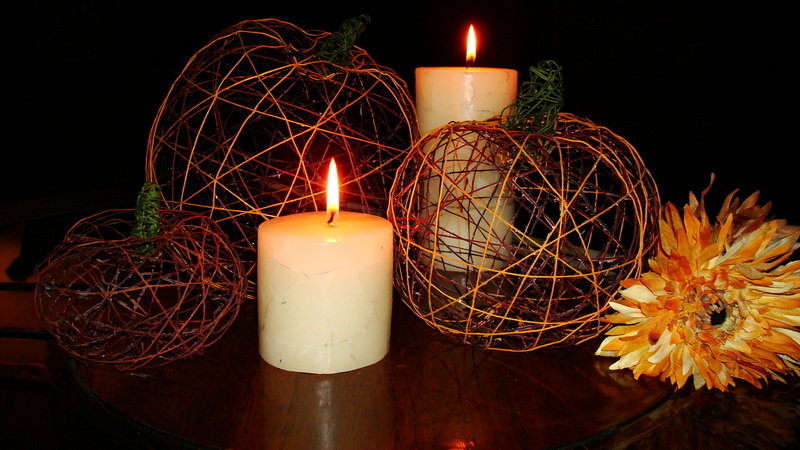 Use small amounts of wax and vary the speed at which you submerge the candle. 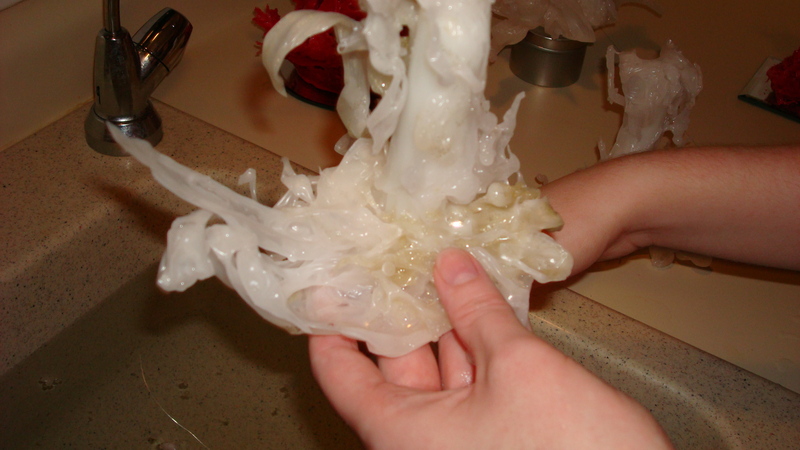 Keep the candle under the water for a little bit to make sure the wax has hardened. To get the candle out of the aluminum pan, holding the candle by the exposed wick, I put it back into the boiling water. Don’t allow boiling water to get into the pan! All you want is for the pan to heat up a little so the wax will melt and release from the pan. 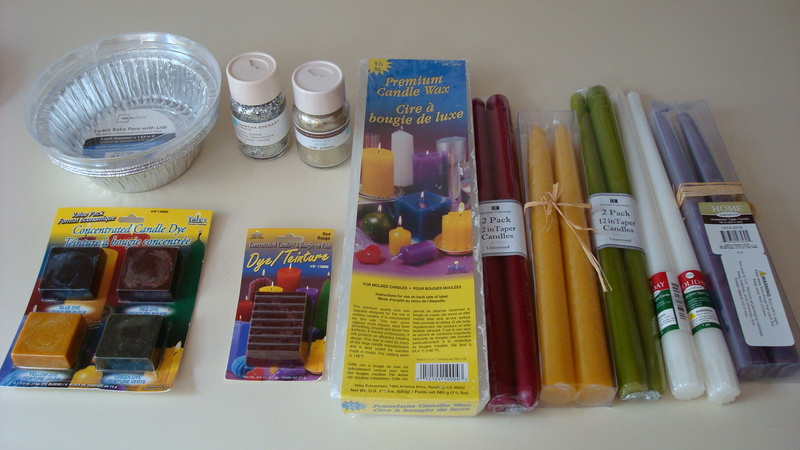 Step 4 – Place the candle on a paper towel to dry. 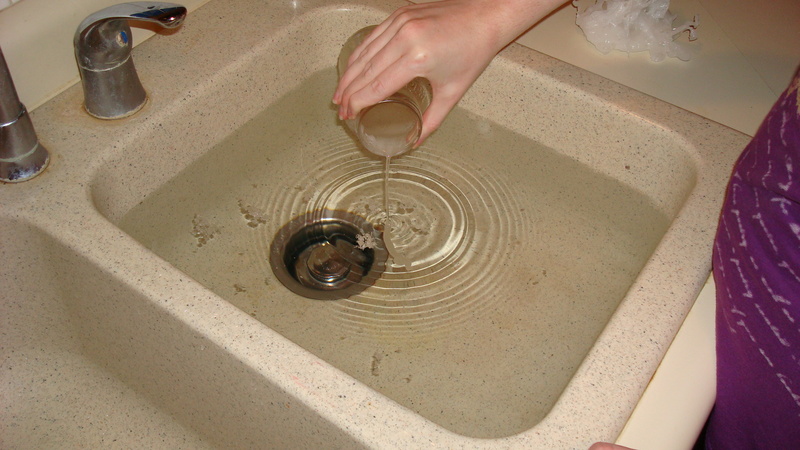 Water will sometimes be trapped so tilt the candle or turn upside down carefully so the trapped water can drain out. For the Ghost candle, I used the same basic technique, except I didn’t use an aluminum pan. 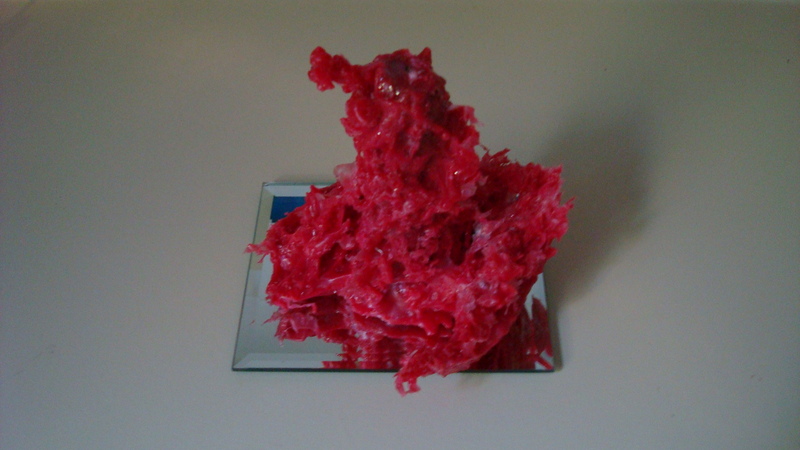 I poured hot wax into the sink and slowly built a “base”. 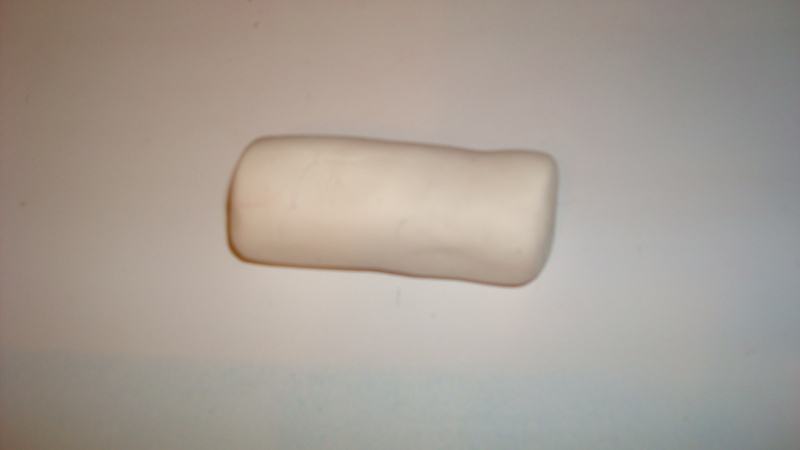 I then “glued” the taper candle to the created base with a small amount of melted wax. To build up the candle, hold the base in the water, pour hot wax down the taper candle, and submerge, repeat until you are happy with your creation. 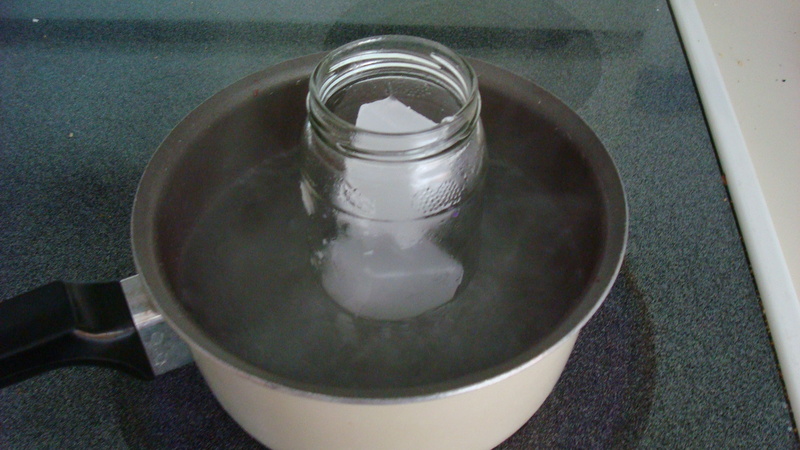 Step 1 – Pour hot wax into the cold water creating a base foundation. 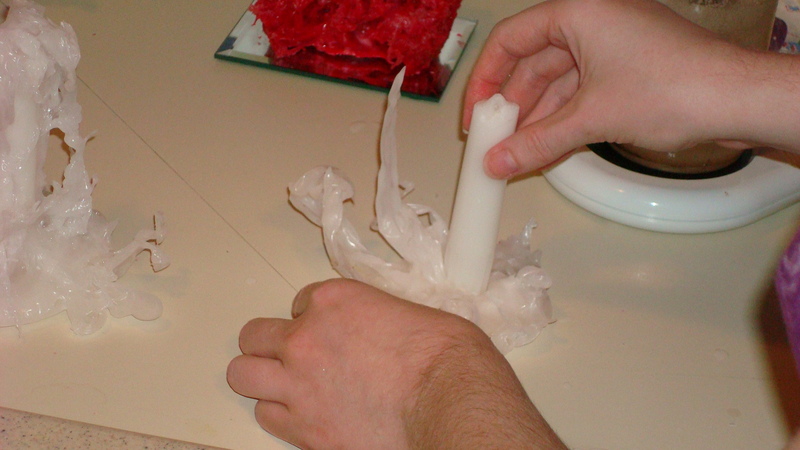 Step 2 – Attach the taper candle to the base with a small amount of hot wax. 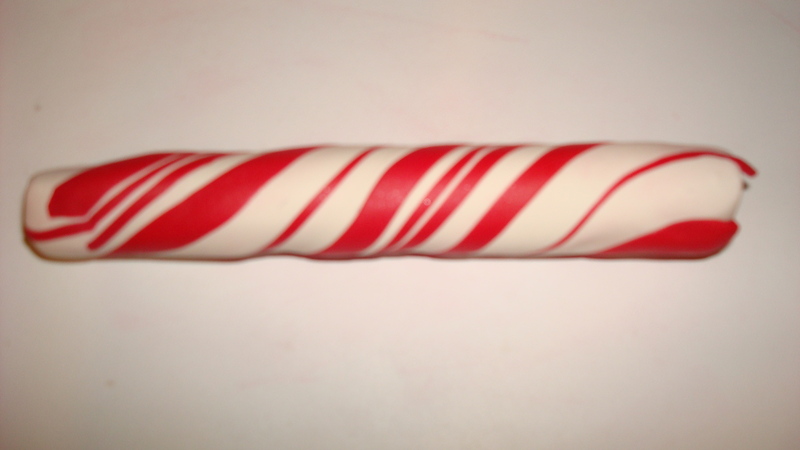 Step 3 – Build the candle by pouring hot wax down the taper candle and submerging. Repeat as desired. You will get hot wax on you and you will get wax all over the sink. 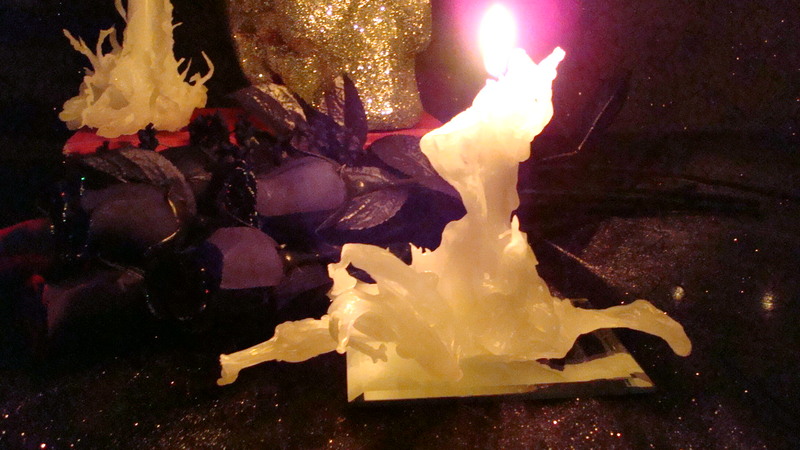 These candles are very delicate, the flowing effects are sometimes very thin and will break off. Be gentle. Next Post will be my Plague Candle and Black Magic Candle! I’m looking forward to creating them! 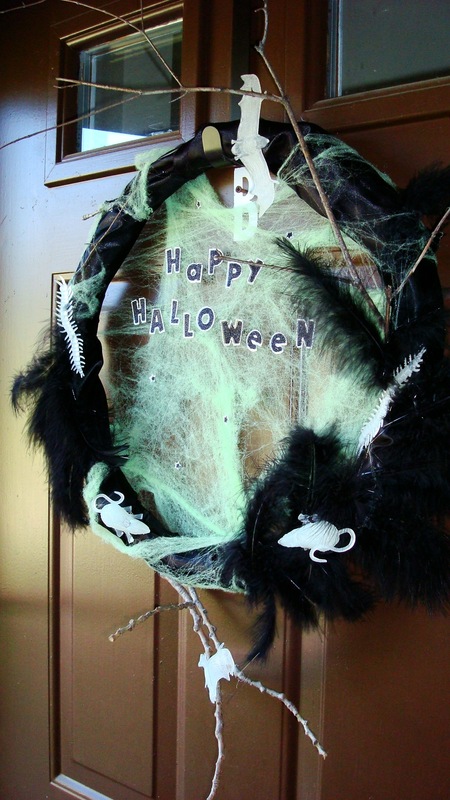 This year I’m hosting a themed Halloween party, so my door wreath needed to reflect my theme. I’m keeping the theme a secret until a week before Halloween, hehee. 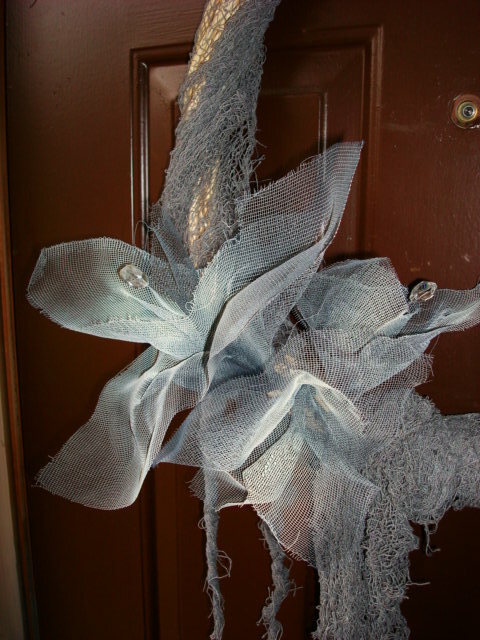 My main goal for my door wreath was that it would function in daylight and at night. 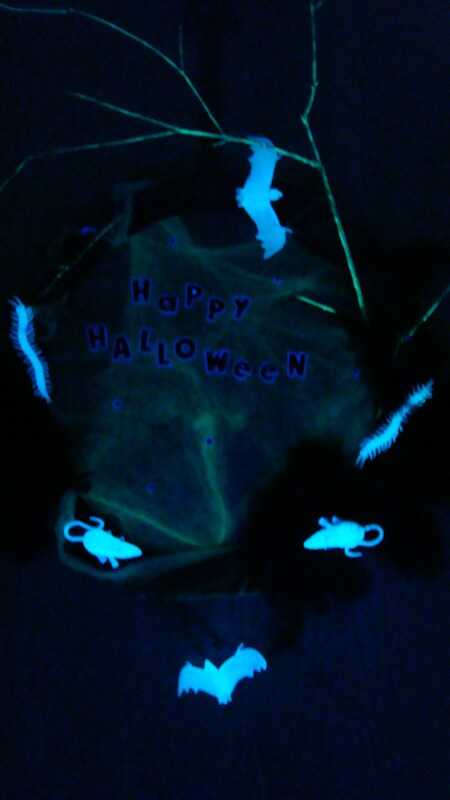 I used glow-in-the-dark paint on several elements in the wreath plus some glow-in-the-dark plastic bats, rats, and bugs. I think over the next week I’ll add more elements to it with more glow-in-the-dark creepy creatures, but I’m pretty happy with how it came out. 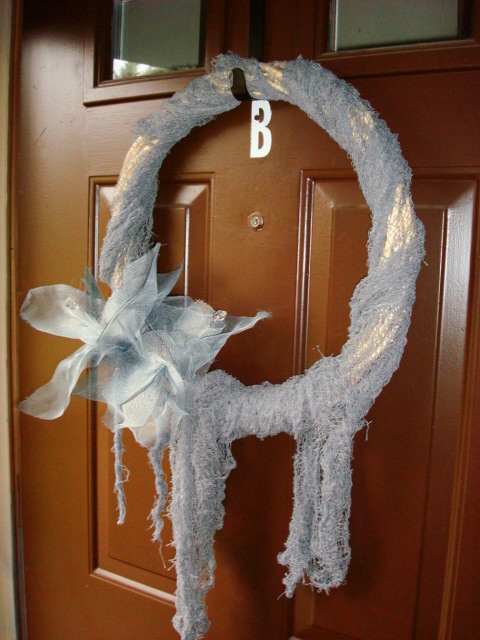 Not too shabby for my first door wreath attempt. 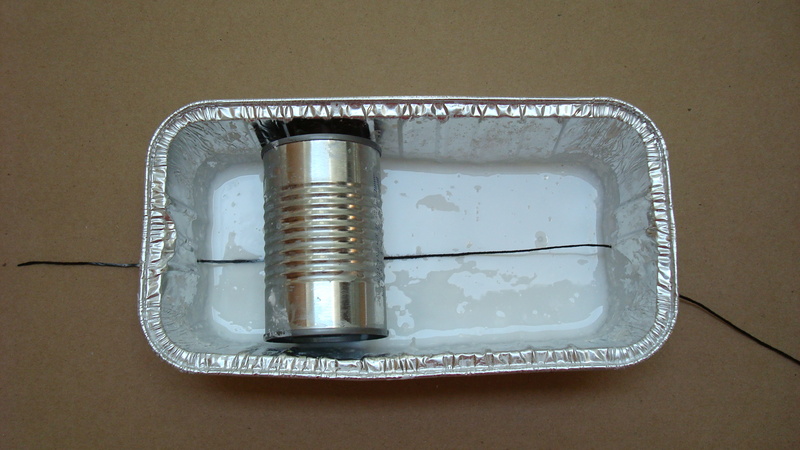 Preparation – I punched one hole on both sides of the tin container about 1″ up from the bottom. Run the floss through the hole on one side, into the mixture, and out the other hole. This helped me save some time and streamline the process. Also, this craft project is messy, I worked on a large piece of cardboard, a tarp would work nicely to. Work on anything that isn’t going to be ruined if you get glue on it. 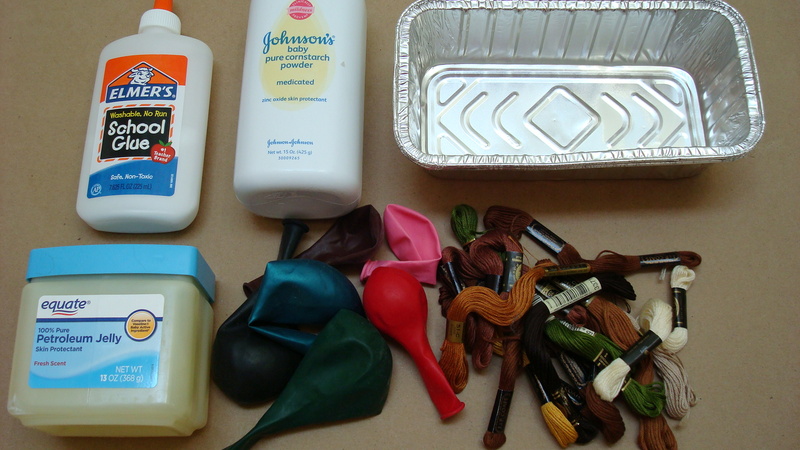 Step 1 – Rub the petroleum jelly over the entire surface of the blown up balloon. 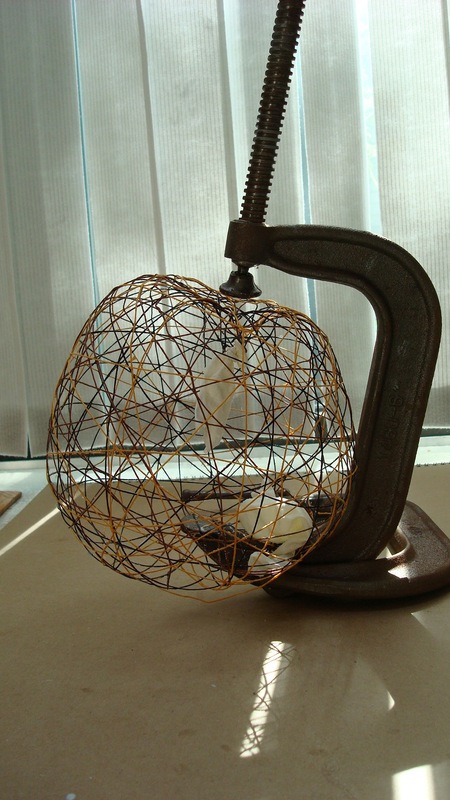 This is done so that glue soaked string does not stick to the balloon. Step 2 – Mix the glue, water, and corn starch together in the tin container until the mixture is smooth. No clumps. 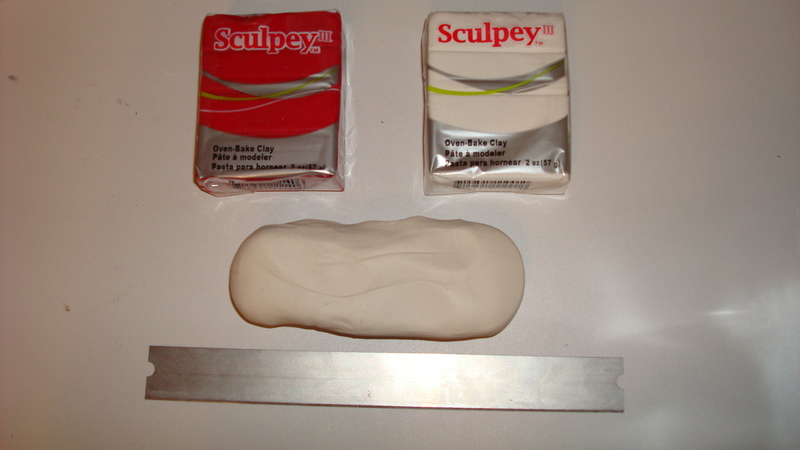 I didn’t measure the amounts, but I used about 1/4 water, 1/4 corn starch, 1/2 glue for my mixture. I used an empty tomato paste aluminum can to hold the floss in the mixture. See the image for clarification. 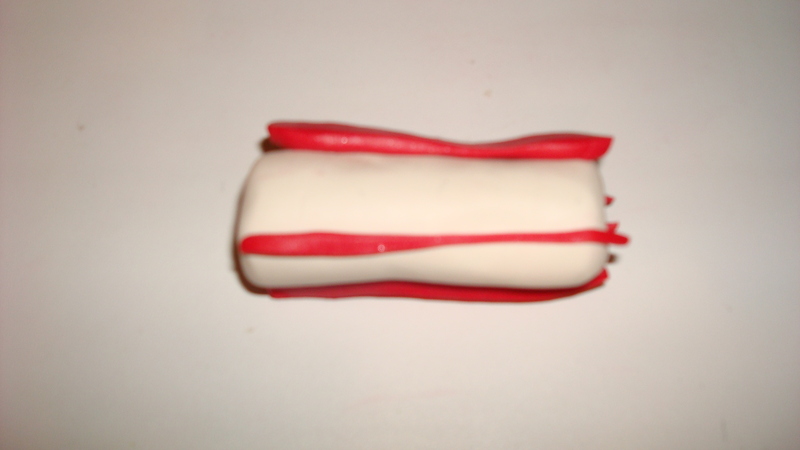 Step 3 – Run the string through the mixture and begin wrapping the around the balloon. Keep wrapping until you have a desired amount of coverage across the balloon. Step 4 – Apply some petroleum jelly to the clamp ends of the “C” clamp. Do this so the glue soaked string doesn’t stick to the “C” clamp. 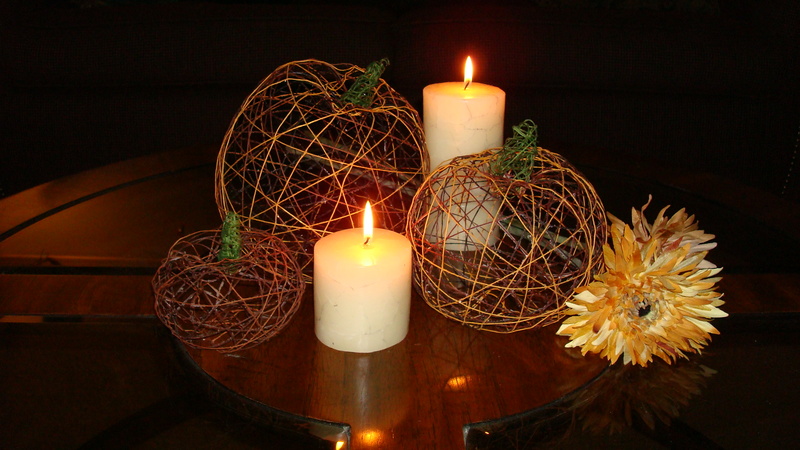 Insert the thread wrapped balloon into the “C” clamp, use the “C” clamp to achieve the squatty rotund shape of a pumpkin. I used two “C” clamps, one to form a base for the second, so the second one would stand upright. See image. Step 5 – Allow the thread to dry and harden overnight. Step 6 – Pop the balloon! I had a dense coverage of thread so I had to fish the popped balloon remains out from between the hardened string. To Make the green pumpkin stem, I used clear tape to shape a curved cone, covered it in petroleum jelly, and used green floss following the above steps. Once dried, glue the stem to the pumpkin. You now have some new decor to add to your living space! Happy Crafting! 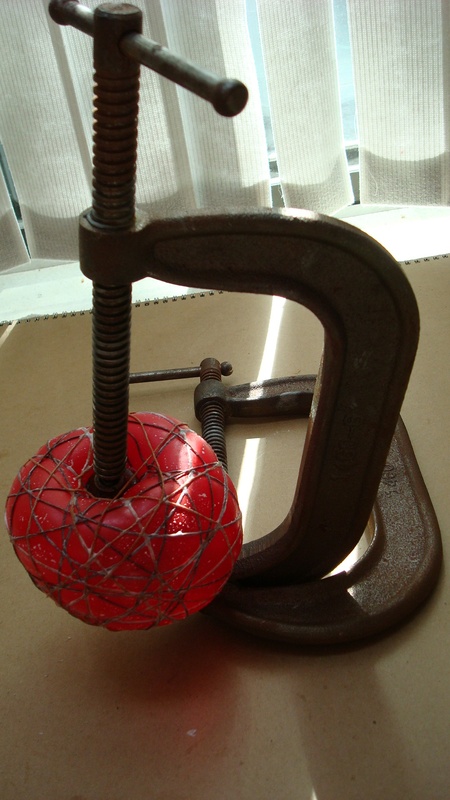 Below is a video showing the wrapping of the balloon and putting the wrapped balloon into the “C” clamp. My apologies as I’m not so good with shooting video yet.